On An Overgrown Path: Third rate music on Naxos' American Classics? Third rate music on Naxos' American Classics? 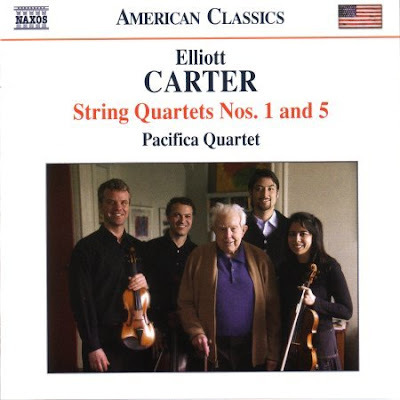 Andrew Clements then goes on to write a glowing five-star review of Naxos' new CD of Elliott Carter's String Quartets Nos 1 and 5 performed by the Pacifica Quartet. I'll agree whole-heartedly with his verdict on the Carter Quartets, I bought them last week and they are superb performances of superb music. But I am not so sure about his other views. That judgement of 'third-rate music' raises the interesting point of should a critic focus primarily on the interpretation or the composition? Good music criticism must, of course, combine both. But the balance does seem to be swinging towards judging the notes rather than the way they are played - is that really a healthy trend? Even if some of the music on Naxos American Classics is less than stellar, isn't it better to record that rather than the 371st version of Mahler's Fifth Symphony? * On February 24th on my Future Radio programme I'll be expressing strong enthusiasm for Elliott Carter's Sonata for Flute, Oboe, Cello and Harpsichord and Pastoral for Clarinet and Piano in recordings from the independent American label Cedille together with transcriptions of Bach's Trio Sonatas by Robert King. Well, I'm an American, and I am not offended by Andrew Clements's statement. I am pleased that Naxos is issuing so many discs in that series, because it offers music lovers the opportunity to hear lots of music otherwise unavailable. However, much of the music in that series IS third-rate. Some of the American music Naxos has recorded actually makes me cringe--I am thinking especially of William Henry Fry, Henry Hadley, George Frederick McKay and Meredith Willson--but I am nonetheless happy to have the option of getting to know it. We have our third-rate composers, too, just like all other countries. It does not offend me if Andrew Clements points that out. I was surprised to see the reference by Andrew Clements about the "third-rate" music on Naxos's American Classics series. 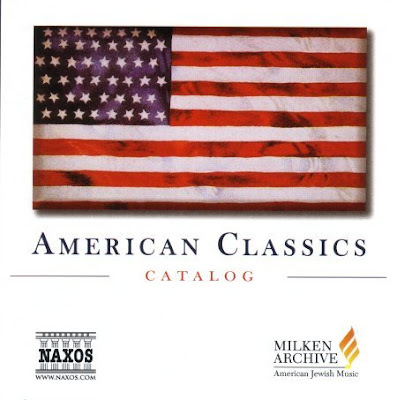 A quick look through the catalog shows that American Classics has released music by Adams, Albert, Babbitt, Barber, Bernstein, Bolcom, Cage, Corigliano, Crumb, Druckman, Feldman, Hanson, Harbison, Hartke, Ives, Kirchner, Moravec, Rochberg, Rorem, Seeger, Sessions, Thomson, Tower, Wolpe, Wuorinen, and Zwilich - hardly a third-rate list. While I applaud Naxos for recording Carter, and Clements for praising the recording, American composers - apart from a few "approved" names (in Carter's case, approved by Boulez) - remain under-appreciated in Europe. Perhaps the Long Tail will play a role in changing this provincialism? Personally, though I'm American myself, I'd rather listen to the 371st recording of Mahler's 5th than the work of any of the American composers named in this thread. I cringe at music and musicians being promoted on the basis of their nationality rather than the intrinsic quality of their compositions. Yes, I guess there's something to be said for recording it for posterity so it's there to be listened to for those so inclined. But, if the world were ending and I had a choice between saving every work ever written by and American composer, or just one movement from any Beethoven, Bruckner, or Mahler symphony, the Americans would be lost. As for Jonathan Harvey's statement, "I've always felt that it is, and will be, strong enthusiasm that will change the world!" Well, perhaps, but it matters what one is "enthusistic" about, and how one wishes to "change" things. Mere "enthusiasm" for its own sake is nothing more than raw dynamism, action, frenzy, etc., not an instrinsically admirable quality. Bolsheviks and Nazis were quite enthusiatic - as are the terroists of today - and certainly did change the world, but that's hardly anything to celebrate. I prefer Prince Myshkin's dictum: "The world will be saved by Beauty". Note well: "saved", not merely "changed". Change is what politicians routinely serve up as an empty campaign slogan; Salvation is "change" of a different sort altogether. And despite having listened intensively three times yesterday to the 'Andante moderato' from Mahler's Symphony #6 (as well as the 'Andante - Adagio' to Symphony #10), I -- for one -- am still very happy to second Pliable's recommendation of Elliott Carter's 'Sonata for Flute, Oboe, Cello and Harpsichord', and Dr Primosch's list of American composers that he feels warrent cultural exploration by the European, American, and Asian intelligentsia. By this logic then, we shouldn't really be publishing most new books. Literature professors don't approve of romance novels and Anime and endless third party additions to the Star Wars story lines, which are probably weak. Do we really need another John Grisham novel or Stephen King short story collection? Let's just stop with Shakespeare and Voltaire and Tolstoy and be done with it. Every year we could reprint a new edition with a new professor's critical commentary on the works. Reasonable people can disagree, and what is deemed third-rate is entirely subjective. I know why some like Carter, but he is not my listening list with anything approaching regularity. But, that is my opinion, which doesn't necessarily mean he's third rate, and that is an important distinction. Personally I don't consider anything I've done to be second or third-rate, though I wouldn't make the claim that Hadley or McKay are the among the absolute top tier of greatest composers (if one must rate them as such). I also would not make that claim for Carter. I would make that claim for Flagello, and we are welcome to debate this. Note to Clements: merely claiming something is third-rate or first rate does not make it so, and his five stars for whatever won't sell any recordings, though his aesthetic judgement seems to offer him (and some others here)relative intellectual comfort and superiority. I hope they enjoy it because that's about all their declamations offer them. Britten and Shostakovich are special cases of latter 20th c. music, where categories of 'absolute top tier' and 'top tier' become problematic, in my view. JW, I'm very glad you've recorded and introduced some of the unknown American repertoire that you have. I think Clements's statement doesn't mean that he thinks the music isn't worth recording, just maybe not in a series with the word "classics" in its name. It would have helped clarify if he named the third-rate names who don't belong in such august company, but maybe that's another essay for another time. Clements' comment is meaningless without his citing who is a "third-rate composer" and what his criteria are. There are many conflicting criteria. For example, I don't think most listeners would cite Carter's music as "first-rate." Besides, most of the standard repertoire comprises European music of the 17th, 18th, and 19th centuries that would be judged as "third-rate" according to most aesthetic criteria. (Let's just start with Telemann, Vivaldi, J. C. Bach, and move on to Saint-Saens, Borodin, Paganini, .... One can go on almost indefinitely.) And how many listeners would be familiar with the music of a great composer like Nicolas Flagello, cited by JW, without Naxos American Classics? Personally speaking I expect listener reaction to concert music is heavily dependent on emotional mood and cultural/historical context . The concept of "ratings" and "tiers" for composers is pretty much an over-rated specialization of critics, which serves the purpose of puffery and closed-mindedness. My father is the American composer George Frederick McKay, who liked to say that "if the criticism of a composer's music gets to be really sharp, then he knows he is writing some good pieces." He also once got a big laugh from hearing concert goers in seats in front of him commenting in reverent tones that he was dead. both encouraging the younger composer musically and inviting him to the family home for dinner and philosophical discussion. Following this, my father launched into a loving involvement with American folk-music, and completely cast aside the "opus' system, which he considered a rather crazy European artifact. As to making critics of his music "cringe," he probably would have enjoyed this, since he had a mischievous and rugged nature derived from his upbringing in the West. His music is far from simple, and in many cases has deep religious and philosophical meaning. Much is yet to be revealed, since he composed nearly 1000 various works. It is doubtful that any of us will ever get to hear high-level performances of all his works, since most conductors are still under the threat of being pummeled by Symphony Society grannies if they get too far afield from the standard concert fare. We have a commercial radio station in Seattle that broadcasts a full month of Mozart works, with one Mozart piece every hour, which gives me the urge to say "give me a break, guys!" Also noted is the absolute repetition of Vivaldi's Four Seasons by glamour-puss groups of all stripes. ALL composers need to have their music performed and recorded. Who judges whether or not they're 1st or 3rd rate without being able to hear them first? This so-called first-ratedness involves a lot of PR as well as talent. Bach was considered 3rd rate until some 19thC composers rediscovered him (or so I've read). In any case, if the world were to come to an end tomorrow and I had a choice between hearing some Beethoven, or Mahler, I'd rather choose something I'd never heard before. Surprise me! Now I'm intrigued about G.F.McKay. I'll order the CD, and then I'll be the judge of that! I think your first sentence quoted above is debatable. Whether first-ratedness is immediately recognizable is another matter. Yes, indeed, Josquin's motets and late Masses, Bach's Passions, and Janacek's operas did take a little time (in the scheme of things) to be fully and widely recognized (in all cases, the most musically intelligent recognized them as first-rate immediately, but these scholars could not necessarily master historical, cultural, and institutional uncertainties). And I don't believe that JS Bach was ever considered third rate -- but rather "old-fashioned" and "overly counterpuntal"; and not as trendy as his French and Mannheim style influenced 'metropol' son(s) who gravitated toward the excitement of Hamburg and London. (Those 19th c. composers who rediscovered J.S. Bach and his Passions were led by Felix Mendelssohn, who apparently had access to a wonderful, large family library of music manuscripts (I believe). Elsewhere, pliable, I didn't see you listing Tippett's Mask of Time or Vision of Saint Augustine (I tried to post this earlier but had a technical problem). Having listened to a number of Naxos recordings in their American Classics series for potential reviews on Sequenza 21 (hey, if folks send me stuff, I'm happy to give it a try), I can say that sure, some things were not my cup of tea. But big deal---I think it's far better that there's music being distributed in addition to the usual things that get recorded all the time. I'm anti-jingoism, but never gave the series name a thought until some raised it as an issue here. I'm still not sure I'm seeing it as an issue. From my perspective, American music isn't given its due. Hell, music from the Americas in general, including Mexico, Central and South America, as well as Canada, are often neglected. I'm embarrassed that I have never heard a note by McKay, and would like to rectify this. At the same time, how many of you European folks are familiar with the music by Charles Griffes? John Becker? Paul Epstein? Jonathan Kramer? irving Fine? All of these are really fine composers, yet sadly neglected. There's a great orchestral work called Images by a Canadian composer, Harry Freedman. I don't know if it is available on CD (I have an old LP from the 70's), but in terms of influence, some of you might consider him ”third-rate.“ Yet this one piece, the only one of his that I know, is amazing and deserves to be heard. One man's ”third-rate“ can be another's ”first-rate.“ I also consider it a ridiculous notion to categorize composers or artists in this fashion. So good for Naxos---we need more of this. I'm still always surprised that with all the various references in the third movement of Berio's Sinfonia, there isn't a single one by an American. It's Europe to the core. Nothing wrong with that, but the notion that EU music is superior seems not to be based on anything objective. Why even think in these terms anyway? Every country has produced, and will continue to produce, great music. The more outlets that exist to get this music heard by even one sympathetic listener can only help everyone in the new music community. What, in the name of all that is holy, does "third rate" even mean? So far as I am aware, there is no set-in-stone scale by which we judge art. The only judgment there CAN be is, "did I, the listener/viewer/reader, enjoy it? did it speak to me/entertain me/make me think?" If the answer is yes, then it's art to you. Everyone's tastes and desires and standards are different. No one else can tell me what is good and bad, because my enjoyment is shaped by my experiences, my life, my tastes. As such, all that can be done is put as much out there as can be produced, make it available to as many people as possible, and then let the individual make their own judgments. Feeling that you and you alone have the right to decide what is good and what isn't, is a pretty sure sign of snobbery and/or close mindedness. There's a whole world of beautiful things out there to enjoy when you aren't hampered by whether or not listening to it makes you seem more or less intellectual. I just thought it worth noting that a little over 14 months after the original appearance of this post, the number of Mahler 5s is now up to 388. We're tracking for 400 by 2010, no sweat (and I mean that literally, alas).